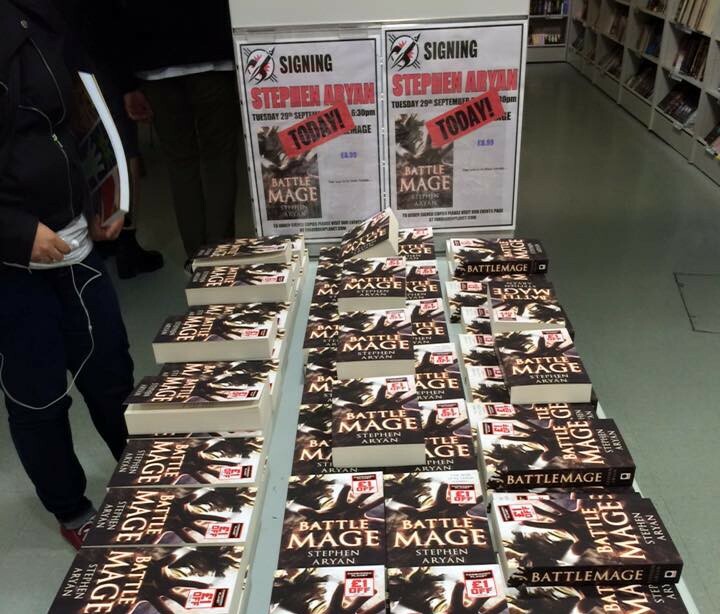 Last week was the northern launch of Battlemage at Waterstones in Leeds, my local bookshop. It was a weird and wonderful night. Weird because I’ve gone to so many similar events in the past, sat in the audience, and listened to an author talk about their book and their world. So when I arrived and saw all of those chairs in front of those Waterstones banners a part of me was waiting for the writer to arrive. It turned out to be a lovely event, and it was great to have so many local friends come out to see me, hear me talk about the long journey to getting the book published, and of course getting a copy signed. This week marked the London launch of my book, which began with a signing event at Forbidden Planet where some of my family attended, making it very special. Danie and the staff there were kind and looked after me very well. I signed some stock, shook some hands, took some photos and had a great time. So if you want a signed copy then take a look here. After that I went across to the Grange Holborn Hotel to the Sky Bar for the September Super Relaxed Fantasy Club, hosted by the most excellent Den Patrick and Jen Williams. 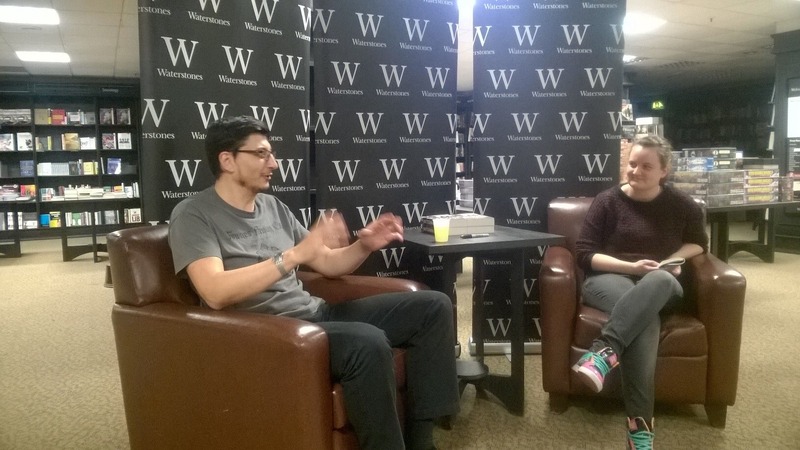 I gave a short reading from Battlemage, and then there was a Q and A session which seemed to go really well. I was pretty nervous to start with, but once it got going my nerves disappeared and I had to just try not to speak too quickly. It really helped having my family there, and so many friends and familiar faces in the crowd. The venue was really lovely as well with amazing views across London, and later in the evening when it was dark I saw the London Eye and other landmarks all lit up. I’m probably in London two or three times a year maximum so it all added up to make it a bit special. So, Battlemage is out there now in the wild. In America, all across the UK (as people have been sending me photos of copies in their local bookshop) and by now all around the world. In the next few of months I’ll be at a couple of events, starting later this month at Fantasycon in Nottingham, and then in November I’m a guest at the SLEDGE-LIT one day event in Derby. After that it will be Christmas before I realise, then in the new year, the cycle begins again as we build up to the launch of Bloodmage, book 2 in the Age of Darkness trilogy! But for now….I’m going to have a bit of a rest.